Lava flows are one of the most visually dramatic manifestations of volcanoes. Their incandescent trace across the landscape has inspired countless paintings and photographs. 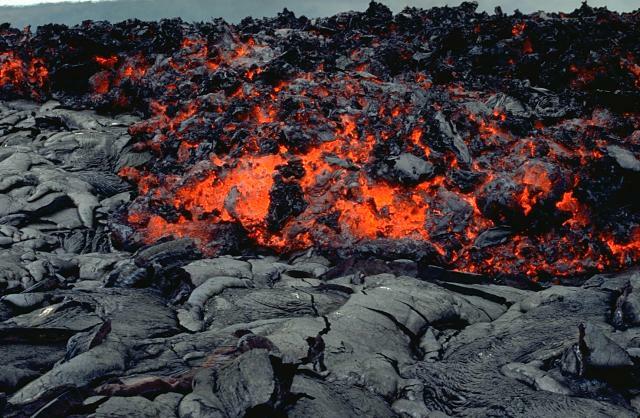 Two common lava flow types are often produced during the same eruption. Aa and pahoehoe are Hawaiian terms referring respectively to clinkery, rough-textured, higher-velocity flows, and less viscous, smooth-textured, lower-velocity flows. More silica-rich magmas produce block-lava flows, whose surfaces consist of dense solidified blocks the size of televisions to small houses, and obsidian flows, which contain large masses of glassy, crystal-poor rocks. Lava flows vary widely in viscosity and volume, and are distinguished from lava domes by their elongated extent downslope. Most lava flows travel less than 10 km, but fluid pahoehoe flows can reach lengths of 50 km or more. Overlapping lava flow lobes in low-relief terrain can form broad lava fields. Flow velocities are typically low enough that lava flows most often do not pose a direct hazard to human observers, but long-term, long-duration flows such of those currently occurring at Kilauea volcano can cause extensive damage to houses and other structures. 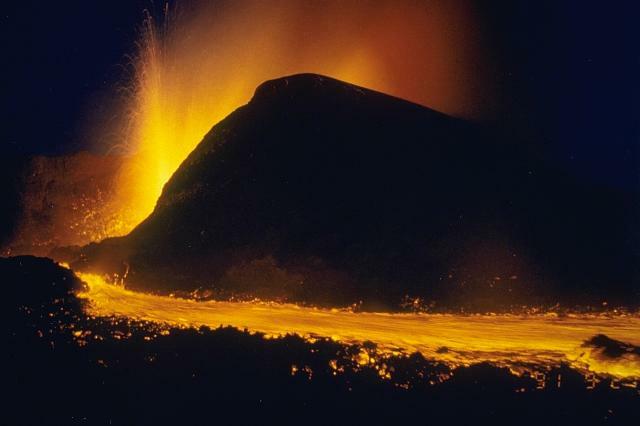 In 2002, fluid lavas from Nyiragongo volcano in the Democratic Republic of Congo flowed through the business district of the city of Goma. The chemically exotic lava flows of Tanzania's Ol Doinyo Lengai volcano have unusually low temperatures and viscosities. Its lava flows are not incandescent during daylight hours. The flows are usually only a few cm thick and travel only a few tens of meters from their source. This 1966 photo shows a small lava flow, only a meter wide, with miniature channels and levees (note the person at the top for scale). Ol Doinyo Lengai is Earth's only volcano known to erupt carbonatitic (sodium carbonate) lava flows in historical time. Photo by Gordon Davies, 1966 (courtesy of Celia Nyamweru, Kenyatta University). Lava fountains from the new cone of Mikombe on the lower NE flank of Nyamuragira volcano feed the lava flow in the foreground. This photo was taken from the SE on 29 September, nine days after the start of the eruption. During the first week the new cone, whose name means "many bats," grew to a height of 60-70 m. Lava flows had traveled 6-7 km NE by the time of this photo. The eruption continued until February 1993, by which time lava flows had traveled 19 km to the NE. Photo by Minoru Kasahara, 1991 (Hokkaido University). 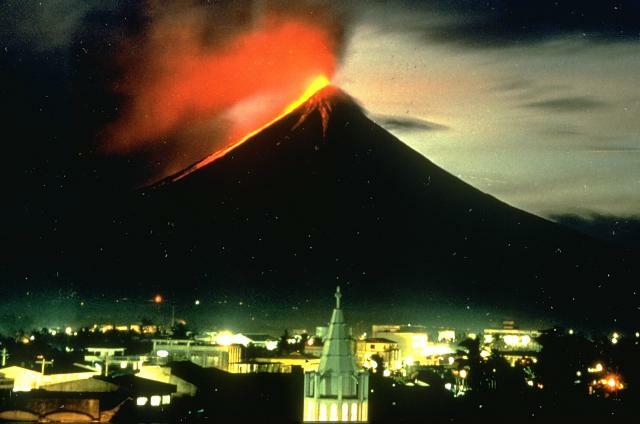 A nighttime view from Legaspi City on September 14, 1984, shows incandescent lava flows descending the SW flank of Mayon volcano in the Philippines. The flows traveled about 4 km to the lower flanks of the volcano, adjacent to previous flows from eruptions in 1968 and 1978. 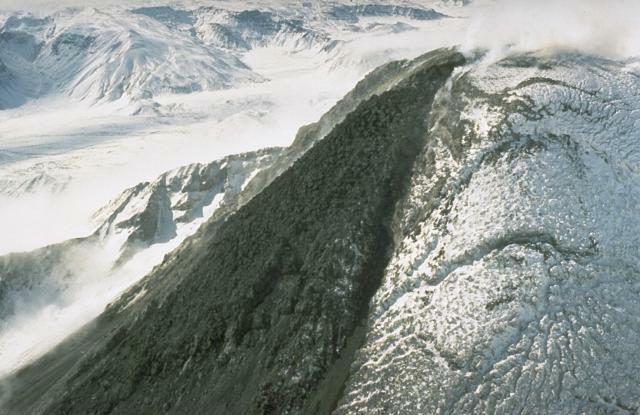 Photo by Norm Banks, 1984 (U.S. Geological Survey). A black lava flow descends from the snow-mantled summit lava dome of Bezymianny volcano in Kamchatka in September 1990. The lava dome has formed during the past forty years both by expansion when new magma is intruded into the dome and by the extrusion of lava flows down its flanks. The dome has grown within a large crater, whose southern rim is visible behind the lava flow. Glassy black obsidian is prominent in the Big Obsidian Flow erupted from Newberry caldera in central Oregon. The high-silica rhyolitic flow covers 20 sq km of the caldera floor. 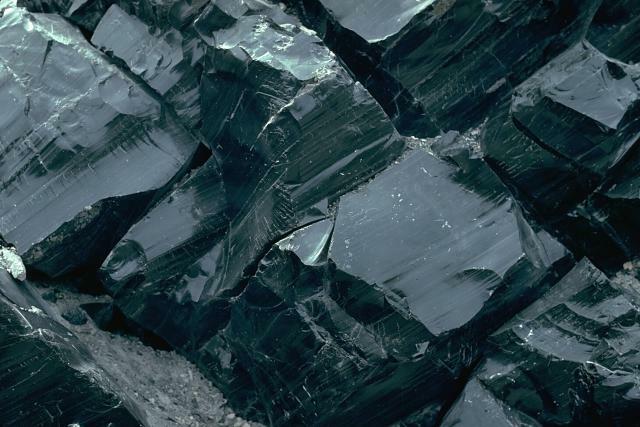 Obsidian flows are never entirely glassy, but also contain large amounts of frothy pumiceous material and devitrified spherulites, which commonly form bands alternating with layers of glass. Two types of lava flows, pahoehoe and aa, are different textural forms of otherwise identical lava. 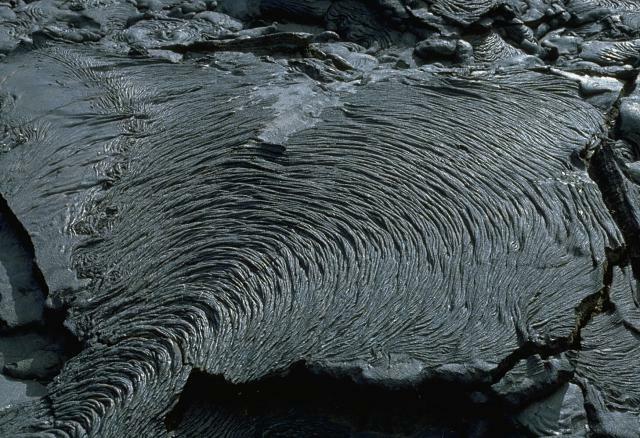 The smooth-textured pahoehoe lavas (left) are formed by stable upwelling of gas-poor lava, whereas the hackly-surfaced aa flows are produced during eruptions with high lava fountaining of gas-rich magma. Eruptions of aa lava commonly evolve into sustained production of pahoehoe. Because of differential weathering rates, the overlying pahoehoe flows look younger than the associated aa flows, and the two flows are easily mistaken for flows of greatly differing age. 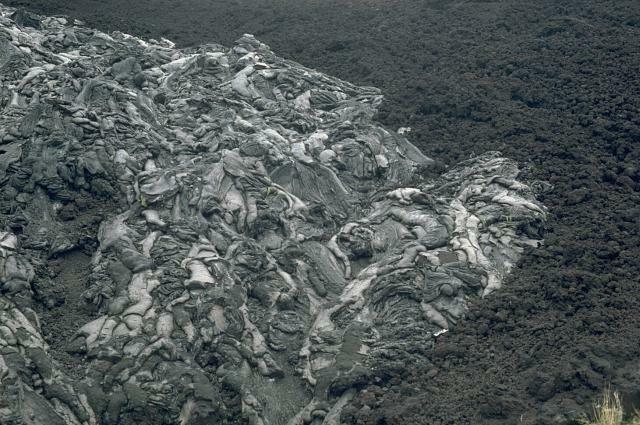 An aa lava flow, with a characteristic hackly surface, advances across a smooth-textured pahoehoe lava flow. The front of this June 3, 1994, aa flow at Laeapuki, near the Puna coast of Kilauea volcano, is about 1 m high. Aa flows are produced by eruptions with high lava fountains of gas-rich magma. 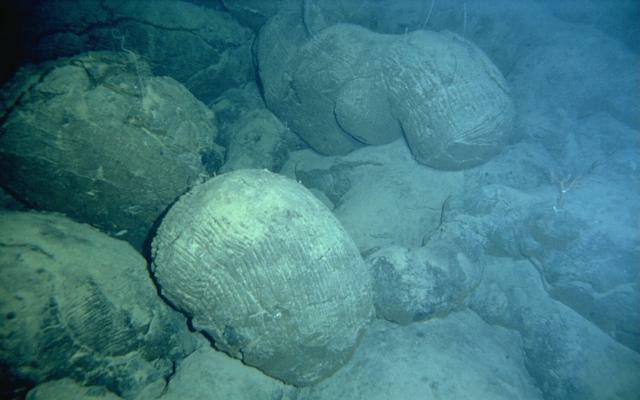 Eruptions producing aa lava commonly evolve into sustained eruptions of gas-poor pahoehoe. The newly solidified surface of pahoehoe lava flows commonly has a silvery or irridescent color that is produced by recrystallization of volcanic glass as it becomes hydrated and oxidized. Pahoehoe lavas form during eruptions that are characterized by stable upwelling of gas-poor magma. 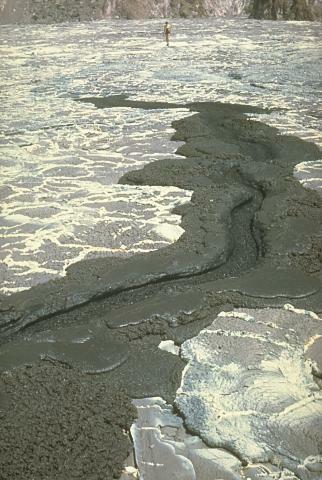 This smooth-textured pahoehoe flow at Kilauea volcano was photographed in August 1994. 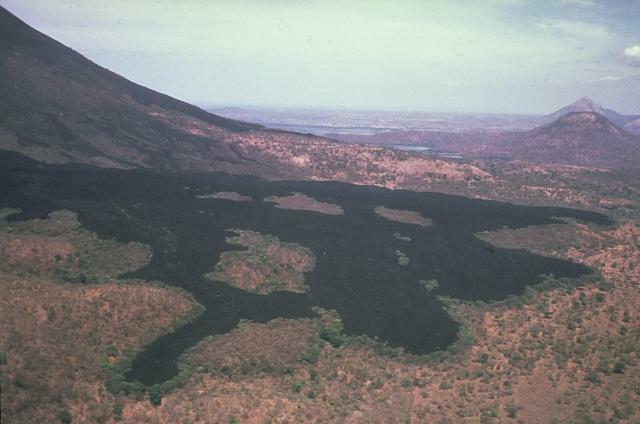 The course of the block-lava flow in the foreground, which was emplaced during the 1975-76 eruption of Mexico's Colima volcano, can be seen descending through the vegetation at the center. The flow originated from the summit dome of Colima and traveled 3.5 km down the SE flank. The flow bifurcated on the upper slopes, forming another lobe that traveled to the east, forming the darker area that descends into the vegetation at the upper right. Photo by Jim Luhr, 1983 (Smithsonian Institution). 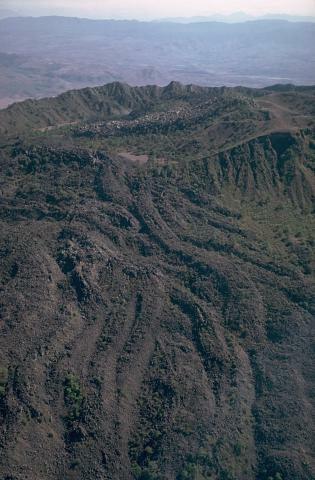 A blocky dacitic lava flow that traveled to the SW from El Brujo vent of Santiaguito lava dome is seen in April 1963, a month after it ceased flowing. The slow-moving lava flow, which has a height of about 50 m, extended about 1.5 km from the vent. 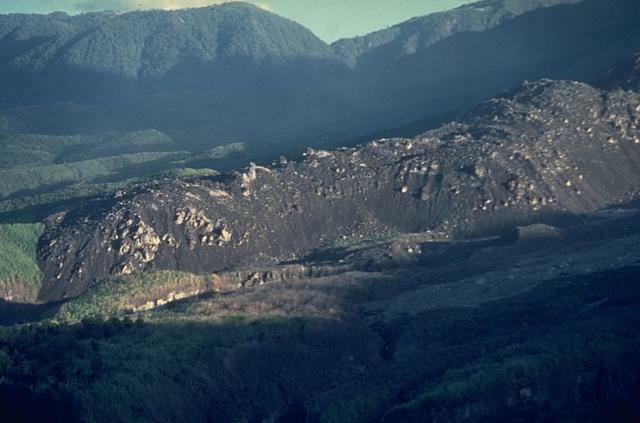 El Brujo vent, near the western end of the Santiaguito dome complex of Guatemala's Santa María volcano, is the youngest at Santiaguito and was the focus of increased effusive activity from 1959 to 1963. Spatter cones form when blobs of molten magma that are ejected from a vent by mild explosions solidify around the vent and form a steep-sided cone. This small spatter cone formed in MacKenney crater of Pacaya volcano in Guatemala on February 10, 1985. 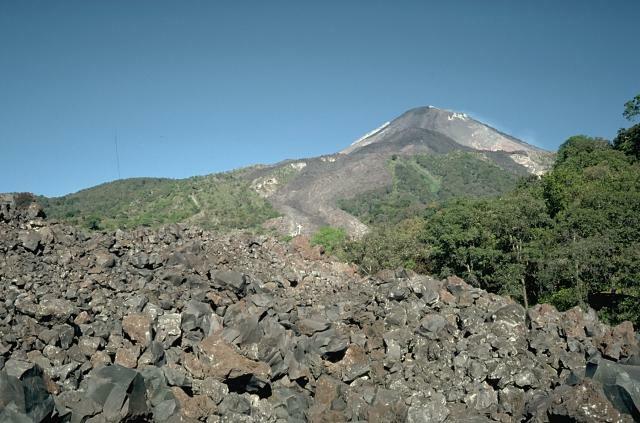 This was part of an ongoing eruption of Pacaya that began in 1965. At the time of this photo, the spatter cone was 6-m high, ejected incandescent volcanic bombs from its vent, and issued lava from its eastern (left) side. Photo by Alfredo MacKenney, 1985. Lava fountains from Fernandina volcano in the Galápagos Islands feed digitate lobes of lava in 1978 that travel across a down-dropped block of the NW caldera bench, about 380 m below the caldera rim. 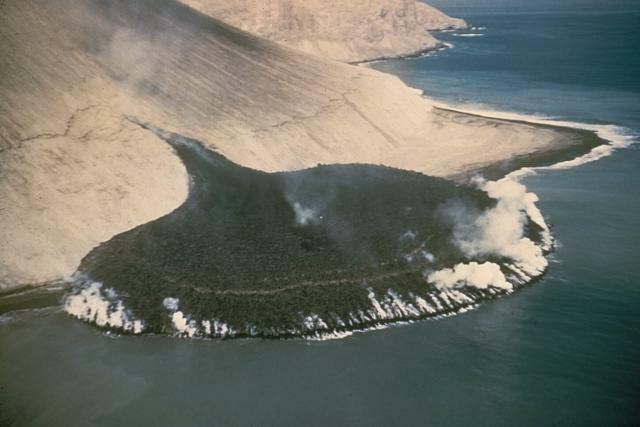 The 1978 eruption began on August 8, when a 6-km-high eruption cloud was visible from distant locations in the archipelago, and apparently ended on August 26. During the course of the eruption lava flows traveled 2 km into the caldera lake, more than 400 m below. Photo by Marc Orbach, 1978 (courtesy of Tom Simkin, Smithsonian Institution). A 30-35 m thick, 1-km-wide steaming lava flow from Navidad cinder cone on the NE flank of Chile's Lonquimay volcano advances down the Río Lolco valley. 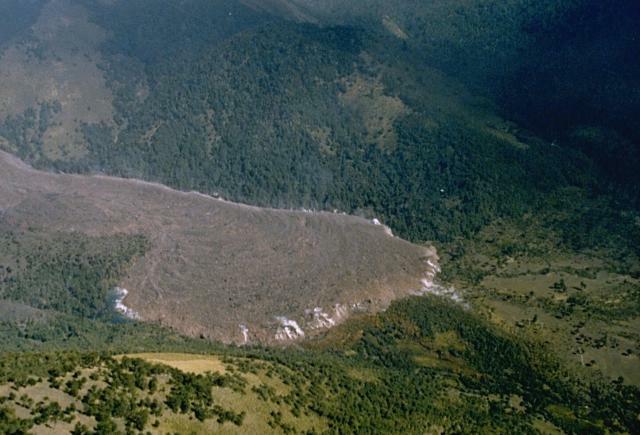 By the time of this March 25, 1989 photograph, the flow had traveled about 7 km. 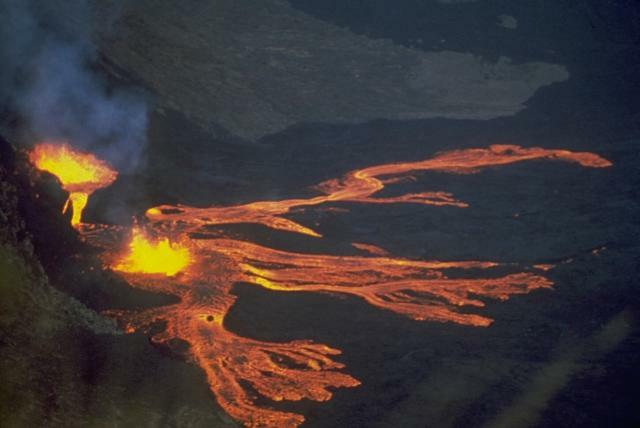 Lava effusion began on December 27, 1988, two days after the beginning of an eruption that lasted until January 1990. The velocity of the slow-moving flow front decreased exponentially with distance from the vent. 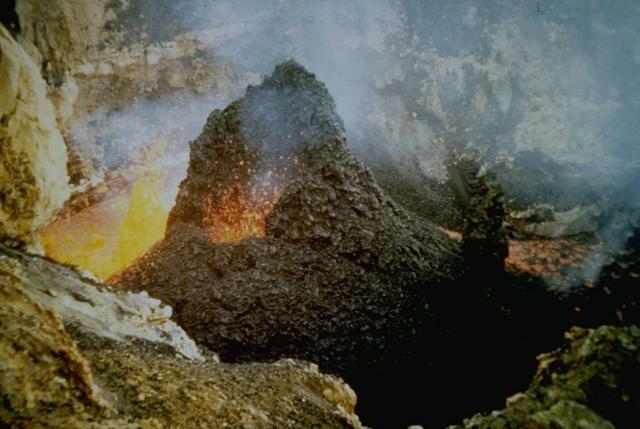 By the end of the eruption the lava flow reached 10 km from the vent and had a volume of 0.23 cu km.